BUFFALO, NY – For more than a century, massive grain elevators have dominated the canal side of New York State’s second largest city. 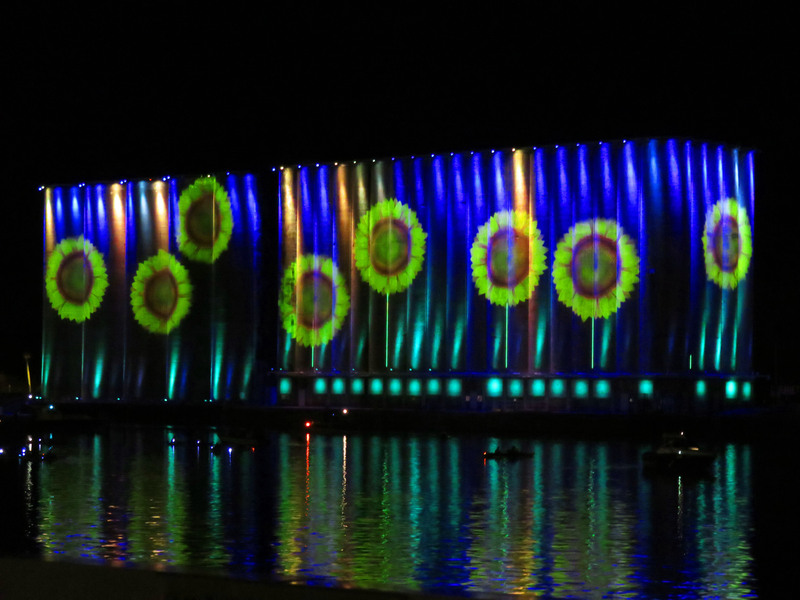 Today, these structures have taken on a new and vibrant life that celebrates Buffalo’s rich industrial tradition as well as its bright future, thanks to The KALEIDOSCOPE, a dynamic lighting art project by Ambiances Design Productions and Foit-Albert Associates. A 360° kinetic installation, The KALEIDOSCOPE is a contemplative public artwork that artistically interprets the seasons as seen through the lens of a kaleidoscope. Every season is represented in sequences that evolve with color changes, movements and texture projections icons that change in intensity and optical distortions as if viewed through kaleidoscope. The colorful, fully automated display runs throughout the year from sunset to 11 pm and changes to reflect each season on a daily basis. A total of 554 luminaires distributed in 5 different types were used in The KALEIDOSCOPE. Almost all of the fixtures (545) have LED technology. Included in this group are 197 RGBW Ilumipod 54g2 IP fixtures from the Iluminarc division of Chauvet. The Ilumipods are positioned on the top and bottom of each silo in the grain elevator. Officially launched on November 4, 2015, at 18:30, The KALEIDOSCOPE is part of a master plan developed in 2012 to enhance and illuminate the industrial heritage of Buffalo’s grain silos. Ambiances Design Productions and Foit-Albert Associates have been developing the project since 2013. The project was initiated by the Erie Canal Harbor Development Corporation and funded by the New York Power Authority (NYPA). Under the artistic direction led by Ambiances Design Productions, Foit-Albert Associates acted as the architect and lead consultant for the design team. "We were thrilled to present this first Buffalo artistic enlightenment project called The KALEIDOSCOPE," said Gagnon. "Our team was very honored and proud to be part of the revitalization era that occurs in Buffalo, using art, and to contribute in our own way through our creative vision for public urban revitalization. We hope that this unique lighting installation on grain silos will inspire the community and tourists alike that Buffalo is a modern and evolving city. We believe that this night transformation of the Connecting Terminal into a light beacon will not only enhance the visitor experience at Canalside, but mostly that it will become part of the new nocturnal signature of Buffalo and help regain his former title as the 'City of Light.'" 1. Make the best possible use of a public space and unique canvas. 2. Create an atmosphere through the use of light. 3. Contribute to the Canalside and Buffalo revitalization through the use of art. 4. Increase public appreciation of Buffalo’s industrial heritage. 5. Pair a vibrant cultural experience with nighttime entertainment. 6. Provide a dynamic, artistic, world-class attraction. Judging from the response to this stunning and ever-changing work of light art, The KALEIDOSCOPE is well on its way to achieving the vision of its creators.